Well it seems that things are finally looking up for the Witches. Following the loss of Skipper Chris Louis - possibly for the remainder of the season - the boys have pulled together and turned in a string of excellent results at home, disposing of Eastbourne, Peterborough and most recently Wolves in fine style. 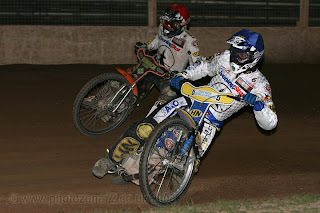 The shot here shows young German Tobi Kroner team riding home to a maximum heat score with stand-in Captain Steve "Johnno" johnston on Thursday night. Tobi faces his first big test in his Witches career from our next meeting as due to some inbalances within the team regarding averages, he moves to a "heat leader" position within the side. Until now he has ridden as a "reserve" - giving him easier rides in most of his races, however, he's aquitted himself well and beaten many riders far more experienced than he is, so we don;t think he should have too many problems making the step-up. A lot of it is in the mental attitude, and young Tobi has his head firmly screwed on - I can't see him letting the pressure get to him too badly. Good luck Tobi! Ben and I added a new piece of kit to our bag yesterday with the purchase of a second-hand Canon EOS 20D. It's pretty much a carbon copy of my 30D - just without spot-metering and third-stop ISO adjustment, and with a slightly smaller screen. For a while now we've noticed that we tend to have our long lenses on the cameras a fair amount when we're out and about, leading to us missing shots which could have been better captured with a shorter focal length. We also had a bit of a scare with the D30 the other week - now sorted out - which left me feeling that I would be "safer" with a more up to date body as a back-up. The intention is that as well as using the 20D as a shared body when we're both out, I can use it as an additional at speedway, saving me needing to change lenses as often - not a bad thing in such a dusty environment. 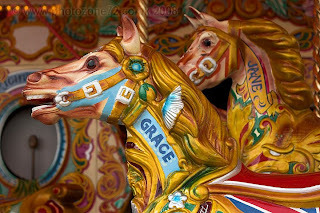 MPB Photographic of Brighton impressed me a huge amount - they were easy to deal with, and their kit is exactly as described. I'd certainly use them again in the future. Having picked up the camera, I took it for a wander along Brighton Pier in order to check it out and get all the custom settings sorted out - judging by this shot, it certainly handles colour well enough! The nifty-fifty project - part 2. As lunchtime beckoned I found myself on the way back to Kings Cross to get back on the tube - it seemed like the ideal opportunity to spend an hour working on another little project I've been thinking about for a while - a wander around St Pancras (St Pancras International as I believe we are now supposed to call it). St Pancras is probably my favourite building in the capital. The outside is stunning - OTT architecture at its very best. The inside has been fairly sympathetically treated - heavy use of glass doesn't exactly suit the character of the building but does at least enable you to see through to the finer parts of the structure from almost wherever you are in the upper part of the station. The brickwork is now as clean as the day it was built and the roof-supporting ironwork has been restored to it's sky-blue painted glory. 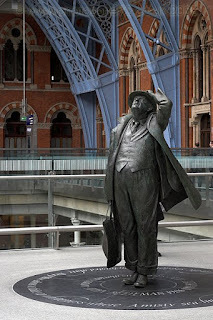 That is presumably what John Betjeman's statue is regarding - and well he might as it's quite a sight to behold. Betjeman has a special reason to look in awe though - he was in part responsible for saving the magnificent building from being demolished when the idea was mooted in the 1960's. Good on you Sir - I'm very glad you did! Thought it was about time the 100mm f2.8 Macro lens saw some action again, and buying a couple of plants for the garden yesterday was all the inspiration I needed to get me going! I love doing macro stuff, but, as I have commented on before, often seem to lack the patience that it demands. Insect photography is beyond me for that reason, if no other - after the little bugger flying off for the fifth time just as I was ready to shoot I'd give up and go in for a cup of tea! These two were both shot using manual focus - AF with the macro lens doesn't really work so well. Settings for the first were f5.6, 1/60th second exposure , and the second - F11, 1/10th second exposure. ISO was 200 for both, as the light wasn't as good as I would have liked. 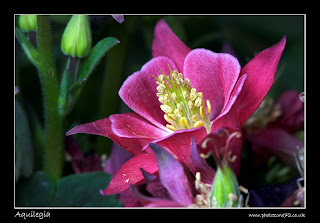 Anyway - the two pictures posted are both of Aquilegia - but quite different flowers as you can see. I also have a beautiful mauve and white one which I may try and do some shots with in due course. I did try a few this morning but got nothing that I felt was up to standard. Now all I have to do is to decide which of these two images I'm going to use as my pc desktop.....oh, and plant them in the garden, of course! Well, as I mentioned yesterday, we had a walk around the South bank area on Sunday while we were in London. I decided on leaving the pub to head down that way that I was going to put the "Nifty" (50mm f1.8 for the uninitiated) lens on the camera and take the rest of my days shots using only that lens. All in all an interesting experiment. 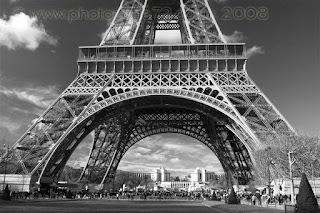 Being restricted to a focal length is strange for someone used to a Zoom. You have to work in a different way - rather than seeing a shot, you have to really look for stuff that will work, and rather a lot of what you frame doesn't, initially, you have to move forwards, or backwards, or change angle...... 50mm did, however, prove to be a lovely length for capturing some urban action from the skateboarders. This shot has been treated to a bit of "funky urban processing" also thanks to an old magazine article I've been carefully hoarding for just this eventuality! I'm expecting this project to be ongoing, in fact I MAY even try some speedway stuff with it. ("It'll be too short to get anything decent" said Steve on Monday when I debated this possibility with him.....hmmm, best get thinking how I can prove him wrong, then!). Keep your eyes peeled. We went up to London on Sunday to watch - and photograph - the marathon. Mindful of the fact that the best pictures tend to be got early on, before the streets get too clogged with the "fun" runners, we arrived at Westferry DLR and walked along the route to our spot of choice, which was delightfully free of crowds and remained so for the entire morning! (no, I'm not saying where, you think we want everyone turning up there next year?!). 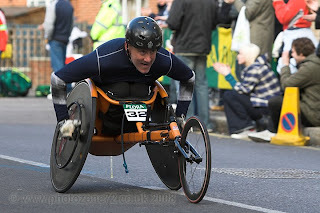 As always the wheelchair race provided some great shots - as did some of the "Backroom" staff - more of those shots in due course, perhaps. Kit-wise it was a pretty simple decision to settle on my standard kit. I started off with the 70-200 f2.8 - with which the shot above was taken - before switching to the 24-70 f2.8 when the course got busier and we started walking around. Once the bulk of the runners had passed us, we headed off along to the South bank (via a pub for a pint and a sandwich whilst my rather damp 30D dried out a little and all its buttons started working again!) and the nifty-fifty got an outing shooting the grafitti and the skateboarders down there. I also got some new shots of the London Eye using that lens - the first time I've shot it using that one, and it certainly put a different perspective on the subject and made me work a bit harder for the shots! Today I finally got to play with my new lens! 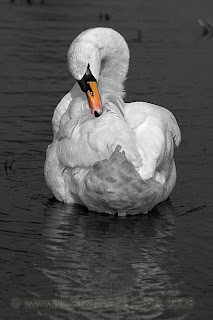 Having enjoyed a dabble with Bird photography while we were away, I found myself thinking more and more about my planned "future" purchase of a longer telephoto. I've had the idea in mind for a while, and at our speedway press day I had a quick play with my friend Brian's Canon 100-400mm lens - mainly so I could get straight in my head what my ideal focal length would be. That confirmed to me that 300mm would be an ideal length for me to go for. A quick browse on eBay on Tuesday turned up a Canon 300mm f4 L IS lens at a decent price, and 48 hours later it was in my hot little hands! Anyway, today we finally got around to a visit to our extremely local RSPB reserve - Rye Meads - and what a lovely place it was. There are various different "trails" to walk, with hides along the way so you can get a closer look at some of the birds. We saw lots of different species, although sadly the Kingfisher was making himself scarce today. I did get a glimpse of a Great Spotted Woodpecker though - forst one of those I've ever seen. 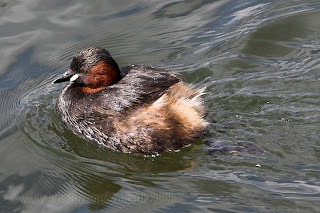 Also got another look at the little chap above - he's a Little Grebe, and we first saw one just a few weeks back on the Loch at Carinish. All in all I'm delighted with the lens - even once I'd added the 1.4x Teleconverter the IQ seems to be superb, and the Autofocus is lightning fast. Definately money well spent! Back out on the centre for the final few heats and for me this is time to play about a bit - hence the posted picture. I like to try to get something a bit "different" - the shot above was with the flash turned off, and shot at 1/80th, f2.8. Heat 15, and either jubilation all round as the witches rack up some vital points, or crestfallen faces and a downbeat atmosphere if things haven't turned out so well. For me it's time to get packed up before heading up to the bar for a bit of a gossip and the "post mortem" on the meeting. Then it's home (about an hour and a quarter for me!) and time for bed - none too soon! 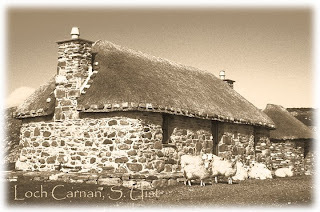 "Postcard" when translated from Gaelic! In the bookcase in the cottage is a great selection of books - from novels to guide books. The night before this picture was taken I had been browsing through a book of old postcards of the Western isles, so when at the end of road we'd just driven along, we found this little cottage with the sheep taking shelter from the wind in front of it, I knew exactly what I wanted from the shot! Processing was fairly straightforward - convert to Sepia, levels, and then a touch of grain added to give that "film" feel. Finally a quite search for just the right font for the wording. Apparently I have a reader in the USA - Hello to Phyllis! Warning all Bloggers - if you receive a comment from user "Salar" DO NOT click on the link as it appears to contain malware! Went for a wander along the lane today armed with 30D and 70-200mm f2.8. To put you in the picture, it's a little lane that used to be a "proper" road but is now closed off at each end. 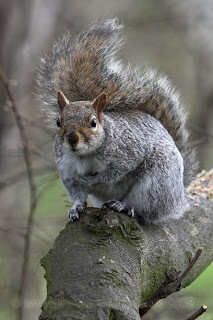 It has a long narrow wooded area along one side, which is fairly quiet and as a result is a haven for all sorts of birds, and our local squirrel population. In the high winds a couple of years ago we had quite a few trees and large branches come down in there, and sensibly (for a change!) the local council has done nothing more than cut them up to remove obstructions to the path, and then leave the bits in situ to rot down naturally. 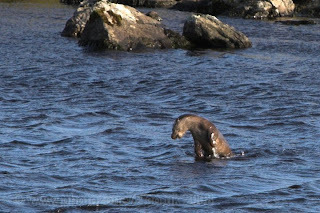 As a result it's turning into quite a nice habitat down there. 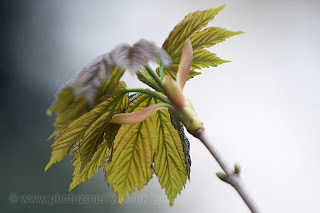 It was the first time we'd really noticed the change in the season - buds are breaking all over the place and this back-lit leaf burst caught my attention. Meanwhile, the squidgers attention was being caught by the bag of Monkey nuts being carried by Ben......this little chap decided we merited a closer look! 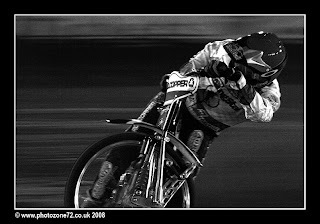 No speedway this week so I will hopefully get the holiday shots finished and uploaded....... watch this space for the new Webshots address for those. Finally, a mention for a blog I'm a regular visitor to now. 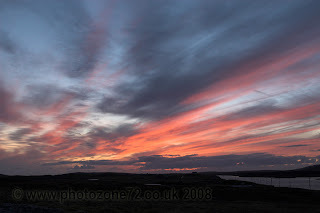 Silversprite - the Librarian at the end of the World is written by a chap living on the island of Berneray but covers far more than just the subject of island life - go on, have a browse! splendid in the Sun - nothing like a walk on a white sandy beach to remind you that you're on holiday! 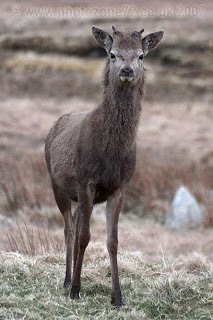 This shot was taken on the Tuesday of our trip last year - we were heading home after a day exloring Eriskay and South uist, and had just turned into the Locheport road leading back to the cottage when, up on the hill ahead of us, we saw a herd of deer. We managed to find somewhere to pull in and sat in the car and watched and waited but they never really got close enough to us to photograph so we drove on. Lo and behold just a mile down the road there was another herd, this time right next to the road! Again we pulled in and I grabbed the only camera to hand - my old D30 which mercifully had the Sigma 70-300mm f4-5.6 lens on board already......I was desperately wishing at this stage that when we'd left our previous stop on South Uist I hadn't decided to put my camera kit into the boot, as I could definately have done with the advantages that my own 70-200mm f2.8 would have given me - notably IS (Image stabilisation) considering by the time that this shot was taken I was hand holding at 1/30th with only the car window-frame for support! It certainly taught me a valuable lesson about leaving the gear accessible! This shot was one of the first I took with my 12-24mm lens last year - I ran really tight on time for getting it - it turned up literally days before we left and I was beginning to get more than slightly nervous! As soon as I put it on the camera all the stress and worry was worthwhile - it's a stunning bit of kit to use on the Digital cameras, but when you attach it to a full frame 35mm SLR it's phenomenal. The film camera gets so little use normally but every time I break it out with the super-wide lens attached I get totally carried away and shoot far more than I intended! I've little doubt that will change any this year.....hmmmm, that reminds me, I must remember to take the film out of the fridge.....! 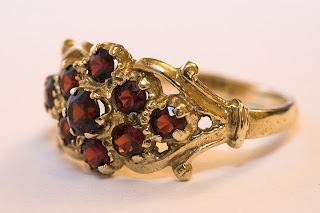 My "Macro weekend" continued yesterday when I documented some of Mum's jewellery too, including this beautiful gold & garnet ring. Lighting this time was via ordinary room lights - which actually worked really well to get a nice bright working environment, and my 550EX speedlite flashgun. The tripod has proved absolutely invaluable over the past few days - doing macro work without it is close to impossible due to the tiny depth of field with the 100mm macro lens. Having forgotten to pick up my remote release before we left home, I used the self timer for this shoot to avoid any risk of vibration from my hands affecting the shots. 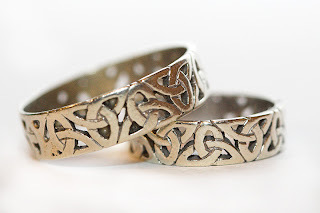 Having little to do this afternoon, I resolved to complete the project I started the other week - that being to get a decent macro shot of my wedding and engagement rings. ISO200, f8, shutter 4 secs. Lighting was an LED torch, all other lights switched off, no flash. 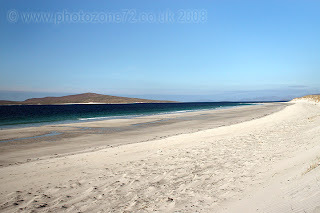 This shot was taken on West Beach, Berneray, on the first day of our holiday last year. 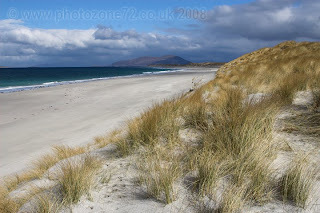 We always try to get in a beach walk on our first Sunday - it's the final step to totally relaxing and soaking up the advantages of being back in the Hebrides again. West Beach is three blissful miles of beautiful white sands and regardless of how far we end up going, it makes for a wonderful walk. On this occasion we went basically as far as you can see in this shot - right off to where you can see the sands curving round ahead of you. 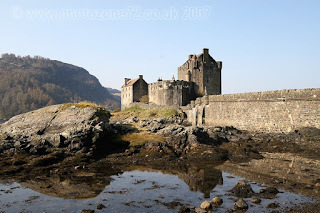 Our planning for this years trip is coming along well now - the ferry tickets are booked and have arrived - next thing now is to sort out our B&B for our one night on Skye - thanks to the ferries being on the winter timetable still on the way over we have to be at Uig for 9.40am to get the ferry across! Life has just been complicated by my wonderful 24-70mm f2.8 lens having developed a fault - it sounds nastily like a bit of grit has made its way into the AF motor as it's making a high pitched whining noise whenever the lens "hunts" for focus at the moment. It's going to be being sent off somewhere for repair tomorrow I think - whether that will be directly back to Sigma UK, or to somewhere like Fixation I'm not sure yet - I'm just desperately hoping I can get it back in time for press day - it will complicate things a bit if not! 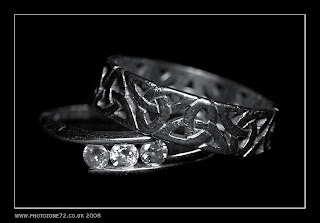 As it was St Valentines day yesterday, it seemed an appropriate day to get my Macro lens out and carry out a project I'd been promising I would do for a while - that being some decent shots of our wedding rings and my engagement ring/eternity ring. The shot above is an example - and a more simple set-up would be hard to imagine! I used a chair, with two sheets of plain white A4 paper on it - one propped against the back of the chair curving round to meet the seat, the other lying along the seat and overlapping the first sheet slightly. Lighting was an anglepoise lamp behind and to the left of me, and hotshoe mounted flash dialed down to -2 compensation. I did experiment with bouncing the flash but direct actually worked better which surprised me a little. Initially there were a few awkward shadows just in front of the rings but these were dealt with first via levels to blow out the background as far as possible, and secondly by a little dodging where needed. 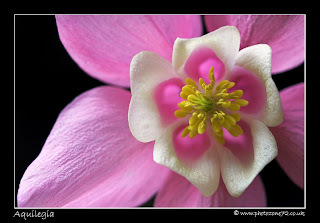 The macro lens comes out so seldom it scarcely seems I can justify having it, somehow. Every now and again though I get the inspiration for a project something like this, and it just makes sense, and I love the challenge of using it. Not being naturally the most controlled and patient of people, I feel it must benefit my photography to accasionally slow everything down and use a piece of kit that actually demands a cool head and a little planning. Time for this to start again I think - just under 5 weeks until we leave now and to say we're looking forward to it would be an understatement! 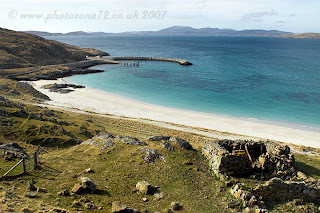 The beach to the right is on Eriskay - which is the small Island to the south of South Uist now linked by causeway. We've had some lovely walks up the hill this is taken from, and this day last year (when we were heading down to catch the ferry across to Barra, but missed it as we misjudged out timings!) is no exception. As ever with these shots I must point out that whilst its had the usual levels, curves and sharpness adjustments through photoshop, it has not been adjusted for colour at all and yes the sea really does appear this blue! Stunning, isn't it! One from Sunday morning this time - as you can see once again the weather was kind to us - more beautiful blue skies! 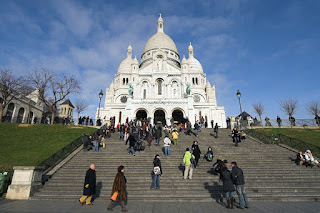 The cathedral itself at Sacre Coeur is stunning - a quite amazing building. I have to say that in spite of it being quite clearly false and trading off its reputation, I also liked the Montmartre area - tacky gifts shops, roaming "artists" and all! We were impressed that our regular metro tickets also worked for the furnicular railway running back down the hill - this is just the sort of thing that, in the UK, someone would be taking the opportunity to make a few more £££'s from the tourists! Possibly still a few more of these to come....they are now on my webshots 4 album if you want to take a look though. Oh dear - FOUR months since I've last been here? Oops. Sorry to anyone who's missed it (well, that's my Mum then!) and I promise to make the effort to post a bit more regularly from here on in. There will be a few more pictures from the trip to come on here I should think - and if you want to see the whole batch then keep checking on my "webshots 4" as they will all be up there before too much longer I hope.